Codiga Park is a fun place to experience the Duwamish River because you can either get right up close in the mud next to it, or you can venture up the hill and view it bending around the park. The osprey pole is often in use, which is very fun to see. We will return for more planting and stewardship! Creekside Mulching on the East Fork of Riverton Creek. The Riverton Creek (East Fork) restoration parcel in Tukwila is progressing in leaps and bounds thanks to the many enthusiastic volunteers and the City of Tukwila’s support of the Green Tukwila Partnership. It is super fun for everyone involved to see such progress unfold in this fun site. To prepare for some upcoming site work with larger equipment, we focused on spreading mulch to protect the ground. Other work included digging blackberry–of course– and some serious holly tree sawing! Ilex aquifolium / English holly is a noxious weed spread by birds eating the berries and thus excreting the seeds all over the place. While it is a pretty winter ornamental, useful evergreen and tough (too tough!) small tree it causes harm to our native ecosystem by out-competing local species that other organisms depend upon. The kids did a great job sawing and hauling it down! Quite satisfying and also important work. Native Planting along the Burke-Gilman Trail. Beautiful November weather welcomed us on the Burke-Gilman Trail in Viewridge for some native planting and mulching with the friendly Forest Stewards from the Green Seattle Partnership. This site has been stewarded for many years thanks to the hardworking neighbors who saw that attention was needed to battle the noxious weeds over-taking the forests. Now it looks stunning, especially cloaked in autumn colours. It feels great to plant more natives to sustain the woodland through the future. Extra big thanks to Dean for always putting out an incredible spread of not only cheer but also pastries, hot drinks and fruit. And shout out to Dean’s go-to spot, the Grateful Bread Bakery for donating to this event–we appreciate you! Squad worked beneath the large luxurious big leaf maples that populate the Cheasty Greenspace. Fortunately dedicated Forest Stewards, supported by the Green Seattle Partnership have planted many new trees to ensure that as the near-monoculture of mature maples decay and fall apart, there are new and various native trees to replace them. Towards that effort, we pulled noxious ivy / Hedera helix down in a ravine. Sadly there were numerous dead ‘adolescent’ cedars nearby–probably killed by even more dry than our usual very dry summers. Note that this wonderful park is has a lantern walk coming up in that forest on November 3rd, come enjoy some light, community art and history-storytelling in the woods. Read more Squad-posts tagged ‘Cheasty Greenspace’ (at right) to find out more about the laudable neighborhood efforts that created access to this special place. Sockeye, Eagle, Osprey, Heron & More in the O'Grady Natural Area. The first autumn Squad event was just gorgeous along the Green River in the O’Grady Natural Area with King County Parks. It is a treat to drive through the bucolic Enumclaw countryside and also a work-party bonus being able to drive down the long winding road to the river as it is usually gated at the top due to it being just a single-lane on a wooded hillside. The lovely trail system is frequented by horses, hikers and runners while the river is enjoyed by many others as well. The Green River becomes known as the Duwamish River in the City of Tukwila and is also referred to as the Green-Duwamish River. We trimmed back and dug out noxious blackberry along the trail, heaping it onto a pallet of dead branches so it could not re-root on the ground. In previous odd years we enjoyed seeing the pink/humpy salmon running thickly in the river. This year we were excited to spot some reddish sockeye during our lunch break along a section of river that changed course significantly and swallowed up a section of restoration plantings. Such is the way of rivers. A bald eagle, osprey and heron also made for a memorable visit to this special place. Back at Magnuson Park for Stewardship on Lake Washington. The Green Seattle Partnership hosted us at Magnuson Park for another fun and informative stewardship session on Lake Washington. We expanded the edge of the mulched planting area by adding many many loads of wood chips. They need to be applied thickly to be effective. The kids enjoy working at it from the top of the pile to pushing the wheelbarrow and of course dumping. We look forward to returning! Stewardship Squad Cancelled for Smoke- a First! Due to the exceptionally unhealthy air quality, King County Parks and myself decided to cancel Squad. We recognize that wildfire and smoke are a natural part of our PNW ecosystem, we respect and also accept it–our forests and grasslands couldn't be healthy any other way. See you next time! Magnuson Park Stewardship on Lake Washington. Thank you to the Green Seattle Partnership and longtime local Forest Stewards for hosting Squad! The blog is on summer holiday for one post– back next time! Squad has worked in many gorgeous locations but the Three Forks Natural Area in Three Forks Park, maintained by King County Parks, has to be one of the prettiest! It was a hot day and our crew leaders did a lovely job of finding us a mostly shaded work site where we pulled weeds from around young native trees, which are protected from destructive animal browsing by little nets. After lunch we rewarded the kids by finishing early and heading to the awesome swimming hole on the Snoqualmie River, which has a fun mix of shallow, mellow, fun current, island, sun, shade and or course-the view of Mt. Si! The kids spotted a fish hanging out in shallow water which appears to be a type of sculpin. A little internet research turned up several possibilities for freshwater sculpin in King County (see bottom of page). The helpful King County Parks staff mentioned that their online Park Finder interactive map has useful layers for trails, parks and public spaces to help you locate natural areas to enjoy, have a look! Squad had another great summer stewardship event at Luther Burbank Park with the Mountain to Sound Greenway Trust. The restoration work has been progressing over the years- continued efforts to remove noxious species will always be needed (birds will always drop blackberry and ivy seeds from berries via their droppings) but a significant plateau of sustainability has been reached in our primary work area under the big Oregon ash tree. Our task consisted of filling buckets of wood chips and hauling them from the great mulch pile to the restoration site. We sheet mulched by overlapping cardboard and thickly covering it with wood chips to kill weeds and protect growing space for native plants. Naturally we had a wonderful swim in Lake Washington afterwards! Pritchard Island Beach is always a fun restoration visit with the kind and knowledgeable Forest Stewards, Kathy & Catherine of the Green Seattle Partnership. The property's past life is fascinating–check out some history of the park area, including how it used to be an island before the construction of the Ballard Locks dropped the level of Lake Washington. There was wonderful salmon art as well, done by an artist and local school children who reused aluminum beverage containers. The Native American style (sans the bamboo) fish weirs, stood vertically, made for attractive and informative markers. When placed horizontally in the water, the fish swim into them but the current prevents them from exiting. Unfortunately for the ecologically sensitive restoration efforts, there is now an an active encampment cut out of the shoreline vegetation that has eliminated years of volunteer efforts. There are chopped plants, trash and debris on the water's edge in the restoration zone such that we decided to work elsewhere at the site. We briefly touched on the basic idea that sometimes people disagree about ownership, environmental significance and best uses for particular spaces–that while we may consider this a community natural area, someone else consider's this their personal home and it is a complex issue to be addressed on another occasion. We were there for ecological stewardship and stuck to pulling noxious weeds, climbing trees, water play and spreading mulch. What a wonderful stewardship event on Riverton Creek with families and employees from the local Target store! A terrific amount of blackberry was cleared-between playing and exploring the creek of course. This revealed even more fun site features (a mini-hill to be queen of!) as well as native alder trees in sore need of rescue from noxious ivy. 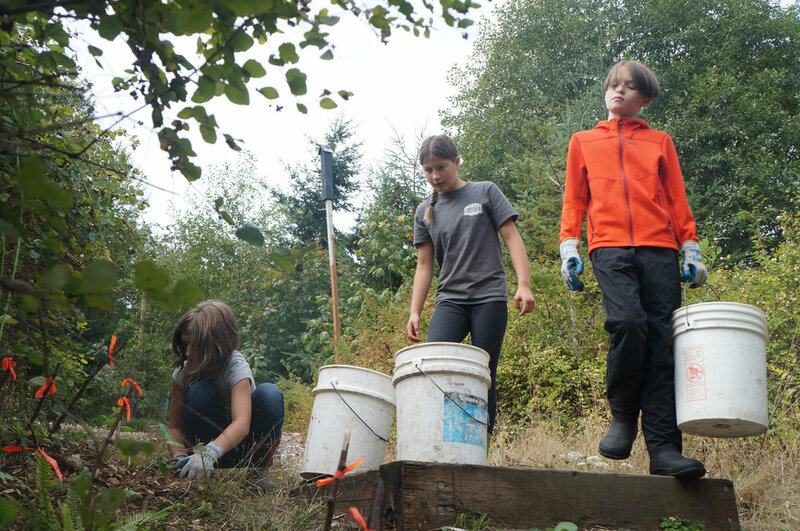 The Green Tukwila Partnership is blossoming beautifully, one if its pursuits it is cultivating community volunteerism out in nature, which provides extensive social and environmental benefits- from civic engagement to healthy salmon habitat, outdoor play and natural beauty. The massive stands of noxious Japanese knotweed on the site are a real threat to environmental health, this invasive species will have to be tackled by professional crews. In the meantime, hardworking volunteers have dug blackberry crowns, hacked noxious holly, pulled bindweed and cut ivy as thick as bottle. We look forward to continuing the exciting momentum transforming this neat riparian site from a dumping ground and noxious weed gallery to a pocket play park featuring nature-play for the diverse neighborhood as well as high quality habitat. We hope you'll join in! Starting a restoration project from the very beginning allows you to be astounded at how much progress gets made in only a few work parties! We had a rare event-host cancellation, so I scrambled to arrange a last minute work party on the Riverton Creek (tributary) parcel and it turned out to be a super fun day clearing noxious weeds and playing in the stream. After just three Green Tukwila Partnership work parties the site is already vastly more accessible and enjoyable. The drying mounds of blackberry, ivy and bindweed are growing tall as the creek access grows wider. The knotweed is on schedule to be tackled by the City's professionally-trained crew this summer and we'll be back to keep on brushing and digging. Shout out to the friendly neighbors who came by to give the kids pretty little begonias as thank-you gifts! Squad made substantial progress in clearing invasive plants from the creek parcel in Riverton, Tukwila. We cleared right up to and across the creek, much to the children's delight! We love being involved in this new city property's restoration as part of the Green Tukwila Partnership. Blackberry was hacked back, ivy pulled from trees and knotweed cut out of the way. The virulently invasive knotweed will have to be sprayed/injected by specialists with a riparian approved herbicide as it is too tenacious to dig out. We moved away last year's dead canes to provide better access and bagged up the felled green material so it wouldn't root on site. In order to keep as much biomass on site as possible we built drying pallets from downed branches and then piled less-virulent weed mass on top so that it may perish thoroughly before being reused onsite as mulch for low-traffic planting areas. For more nearby nature happenings in Tukwila check out the Backyard Wildlife Festival with fun for the whole family on Sat May 12th. 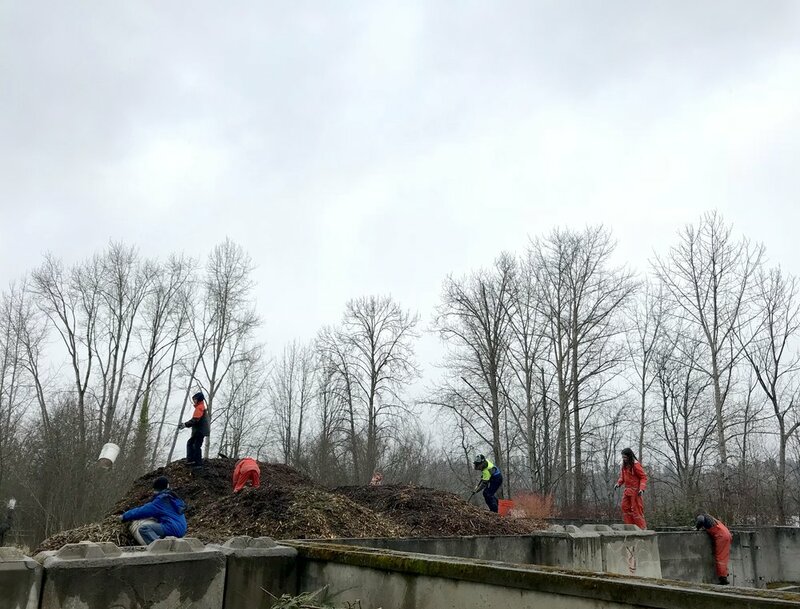 Squad braved the April showers to plant a variety of natives at the north end of Magnuson Park, not far from Lake Washington. Dedicated local forest stewards have worked this region of View Ridge for many years, most recently supported by the Green Seattle Partnership. We also mulched and cleared a few weeds from around the young plants getting established. The overhanging native big leaf maple / Acer macrophyllum was in lovely full bloom. We look forward to returning in the summer for Stewardship Squad's work/swim events! The lake will be very inviting after getting tired and grubby doing good work. It is always fun to work on restoring the old clay pit mine on Cougar Mountain with King County Parks. It was muddy of course, but less dramatically so now that the hydroseed has stabilized the clay somewhat. The gloppy clay was the perfect place for a bear to seemingly leave a clear print for us to find though! Have a look below. The wet lowlands are a great place to drive live-stakes (fresh sticks) into the ground. A few native plants will grow roots when driven down into the soil–cottonwood and willow are ones we planted, osier dogwood is also one that will root. Click on the 'clay pit mine' tag at the bottom of the post or at the right to read more about the fascinating history of this site, which created the bricks for Red Square at the UW. There is also an impressive beaver dam on the (closed) road you can take on foot to hike into the overlook of the site, where there is also signage. Acres of Baby Trees for Tolt MacDonald Park. Tolt MacDonald Park is getting hundreds of baby trees! King County Parks has cleared significant acreage of noxious blackberries that is now ready for planting. We helped out by putting in young Douglas Firs and Western Red Cedars. It was quite the impressive crew coming out in the pouring winter rain! Watching this new forest grow up will be very special for all of us to witness over the years. It was our first occasion to work on this beautiful public land in Carnation. It has a wonderful bridge over the river, which is also fun to play along. The park has camping and also yurts that can be rented. The next step for this site is mulching the restoration area to retain water during our dry summers, as well as to repel weeds-particularly all those blackberry seeds that will be threatening to sprout if given the chance. We look forward to returning to help out! It is neat to work through all of the seasons at Luther Burbank Park with the Mountains to Sound Greenway, from summertime weeding to springtime mulching and autumn planting. We gazed longingly at Lake Washington thinking of our fun summertime swim-after-stewardship events. In the meantime it was perfect cool, damp planting weather for putting natives in the ground at our longtime restoration site underneath the big Oregon ash tree / Fraxinus latifolia. This site used to be a dairy farm and the concrete stall remnants can still be seen and happily played upon. The mulch pile was fantastically large and offered up much enjoyable work hauling it over to the planting area in buckets. Teams switched off filling, carrying and planting.